Love Irish Food has been billed as one of the biggest promotional campaigns of the autumn. More than 30 of the Irish food sector’s major players, including Tayto, Ballygowan, Batchelors, and Barry’s Tea, have come together to in an attempt to boost sales. In the coming months, these brands will begin to carry the “Love Irish Food” logo on their products. Chairman Jim Power said the logo gives “an absolute assurance to consumers that the brand carrying this symbol is above all else, a truly Irish brand with the hallmarks of quality, heritage and values synonymous with trusted Irish brands”. Brands can only carry the logo if at least 80 per cent of the product’s manufacturing process takes place in Ireland and if ingredients are sourced locally where possible. In a survey of some 400 people (mentioned here), 72% said they bought or tended to buy what they knew to be Irish brands, so the venture seems like a good idea (even if the survey is lightweight — what people say they do, and what they actually do, can be very different). Unfortunately from a design perspective, the logo joins the likes of Blackburn Market, Barrow, and Belfast in its “compelling originality”. Love Irish Food is based in Dublin, one of the emerald isle’s two capital cities. Surely the designer knew of the logo for the other capital city, Belfast. After all, it’s just a short skip across the border. From looking at the Pigsback.com website, I would’ve thought there’s a much more appropriate Dublin-based web design studio. A phrase about a book and its cover comes to mind, but do they even offer a design service? You can do better than that, guys. I asked biz-R (the studio responsible for the Food & Drink Devon identity designed almost five years ago) for their thoughts about the similarities. I’ve been sent the logo that Love Irish Food first used to promote the concept to the food industry. Get your chops around that. Having seen all of these logos popping up gradually on the net, I find it very hard to believe the designer of ‘Love Irish Food’ didn’t wrangle a little ‘creative influence’ from them. The lack of a B in the brand name just goes to show how little thought even went into ripping off someone else’s work. Plus I’m pretty sure there’s something wrong with that highlight. It probably could have worked better as a four leaf clover/heart. The shiny quality is total cheesiness to me. There are so many more directions this logo could have gone which i think is evidence of a lack of effort. Ian, that highlight looks like an after-thought to me, as if someone on the committee wanted the design to be more “webbish“. Alex, you’re right. If they were going to use an idea that’s clearly been done before, why not go for a derivative of a shamrock heart? It definitely looks un-thought out (also don’t like the pointless highlight). I agree with the clover idea – I would’ve started brainstorming with that, although a little predictable. Still would have made more sense! The client doesn’t seem to be very discerning. It must be considered a great coup to have your logo displayed all over the country at such high visibility, but at the same time, do you really want to be known for having produced such an amateur design? I don’t think the “B” is that obvious, specially because the tip of the “heart” is not “closed” like the other logos. I don’t think it is a ‘B’ at all. I think it’s a loveheart (for ‘Love’) and shamrock leaf (for ‘Irish’). It’s because it’s been used elsewhere as a ‘B’ that the connection is now being made. I find it difficult to believe that the designer responsible had no idea of the similarities between this logo and the others shown here. The shamrock idea also works because, as well as being an Irish emblem, it has a ‘natural’ tie-in. The heart/shamrock idea is quite nice – a different treatment of it though was essential. Nice to see that shamrock-heart t-shirt – I was thinking along similar lines reading the post! Did anyone ever think that the designer may have been instructed to follow the design of Belfast/Barrow? I think that may be more of what happened with the creation of the logo. I seriously doubt the designer proposed this as an original design. Oh, you wanted this logo for an online business? Hold on, I’ll be back in five minutes. I’m just adding a gradient and a shiny bit. Jun-Yi, I think the shamrock / heart idea is predictable too, but sometimes the obvious idea is the most appropriate. And I agree about the coup. I’d love to have created a design that will be circulated throughout supermarkets and homes across the country. Martin, yes, that’s a valid point. My spiel about the B is unnecessary, because that’s not what this is about. It’s more to do with the design from biz-R (for those who commented previously I have updated the post with a quote from biz-R’s creative director). It’s hard to know what another designer did behind the scenes or was instructed to do. That said, whoever pushed for the heart like previous Irish logos – designer or client – might have considered moving away from the cliche. But then maybe they wanted it to be cliche? I reminds me of a throat lozenger. Not one for the portfolio that’s for sure. I’m reluctant to criticise any creative work, as we all know what can happen to the initial creative proposals once they are ‘presented’. However even allowing for client instructions the final execution is so similair to Food & Drink Devon that it’s hard to imagine this has not been a major influence on the design. That it’s for a relatively high profile project is unfortunate for all involved. Copyright issues aside, I’m a bit disappointed in the final execution. The glassy look has been around for so long it’s an easy one to get right but this sadly falls short. Perhaps while the agency was in the process of taking a short-cut with the creative they should have gone the whole hog and downloaded a better green bubble from istock too. Pretty funny. I bet you they must have gotten paid a lot to rip off someone’s logo. Like you, David, I’m reluctant to criticise, and as Giulietta rightly points out, we don’t know what’s going on behind the scenes. But there’s always a place for constructive criticism, and the thing for me is, regardless of unknown actions or politics, someone should’ve taken a stand against this one. It’d be good to know that there was a firm “no” along the way, don’t you think? Even if it was in vain. Off-topic, I just enjoyed browsing the contextual imagery in your portfolio (I’m sure I’ve looked before, but don’t think I ever said). Can’t help but think it would’ve been great to play the “heart/shamrock” card on this round. Either way, it still wouldn’t have convinced me to love Irish food. Irish beer or whiskey sure, but food, no. As a Dublin based graphic designer it embarrasses me greatly to see this kind of shoddy work coming from my fellow designers. Does nobody here have enough passion for their work to read the logo blogs now and then? And why not get an agency that can handle web and creative? Pigsback? Jeez, Dublin Bus would have done a better job! So you know, I’ve just been sent the original logo design that was used when Love Irish Food were pitching the idea to the food industry. The post has been updated to show it. Why would they send you that? It makes me sad to think that theres a designer out there who would let that out for any reason. Theres so much technically wrong with it, but whats with that little corner showing through where the bite is? It screams of MS Paint. A corner? That’s the mark of a cavity on the tooth in question. There ain’t no dentists here in Ireland. Hey! I resent that :P I have a perfect set of teeth! My mistake, Jonze. Let’s say I was referring to Northern Ireland. No disrespect to your excellent set. I knew what you meant about the corner. I suppose it’s worth noting that I can’t vouch for the person who supplied the file. For all I know, they could’ve created it themselves (yep, great detective skills David), which is why it’d be good to hear from a Love Irish Food rep or designer (I sent them an email inviting them over, but no reply as yet). Getting specific here, the offset LOVE IRISH FOOD on the bitten heart is distracting. Center it. In my option the similarities and highlight is probably the result of the client, however the bitten heart is hardly a compelling logo. As for the corner that is clearly from a cracked thooth? Atleast they tried to make that authentic. On the topic of Irish food, I once had an English friend make fun of me because I ordered a sandwich that had ‘Irish bacon’ on it. His ridicule stopped when the sandwich came and he said “Oh, that’s English bacon.” Being from the States, my question was, “How can you tell?” Still waiting for an answer. The terrible shiny web 2.0 in the corner just looks like a complete afterthought and makes a bad logo even worse. Its a bit embarrassing seeing something like this out in the open, for all the world to see. They should have just added a leprechaun into the mix and used that instead. and are recognized year after year for it. 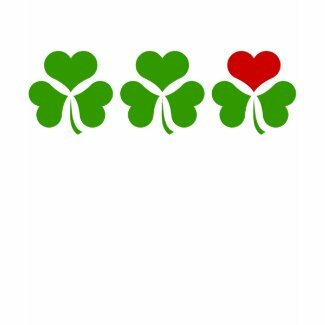 Predicatable or not, I think the Shamrock heart would have been a far better direction to go in. Plus a good designer would have been able to think of an original slant on using a shamrock within the design shape. I find the design incredibly lazy. Well granted it’s not going to win awards anytime soon, but let’s give them a break, people. Having one client critique my work makes me slightly nervous, I can only imagine what it would be like to have an entire nation do it. Although, yes, the shamrock would have been MUCH better. Pity they couldn’t find something at least marginally related to food. I am Irish and really think it’s a shame that a country famed for its artistry and originality and which has a design heritage dating back thousands of years (re: Newgrange, Co.Meath) could come up with something as paltry and uninspiring as this. I am slightly concerned that the person who designed this seems to of been so lazy to not of faded the white out of the highlight gradient, i may be wrong but it looks weird that highlight. strange. all funny though, someone got paid to do that. A ‘NornIrish’ designer here. I can’t honestly judge my own work – my Mum likes it and I earn a living, good enough for me! – but we have some seriously nice design work happening around Belfast these days, just because you haven’t seen it doesn’t mean it’s not there. However, speaking for myself and a few design friends, we are gutted by the Belfast ‘B’ logo travesty, a true design by committee if ever there was one! And for a logo promoting Belfast, I’m led to believe Belfast City Council, as proud of our city as they are, buggered off to England to get the ‘B’ job. I disagree, Niall, there are a number of superb restaurants in Northern Ireland. You’re right, Al, there is some excellent design work coming out of the country. I’ve previously featured McCadden Design as a very small sample.